05-773A4Spring, 2019, Mini 4. Computer Science Perspectives in HCI, (CS Mini). 05-863/45-888Fall, 2018, Mini-2. Introduction to Human Computer Interaction for Technology Executives. 05-830Spring, 2017. Advanced User Interface Software. For Spring, 2019, I am teaching: 05-640 Interaction Techniques. Jump right to the schedule or homeworks. I am also teaching 05-773A4: Computer Science Perspectives in HCI, (CS Mini). 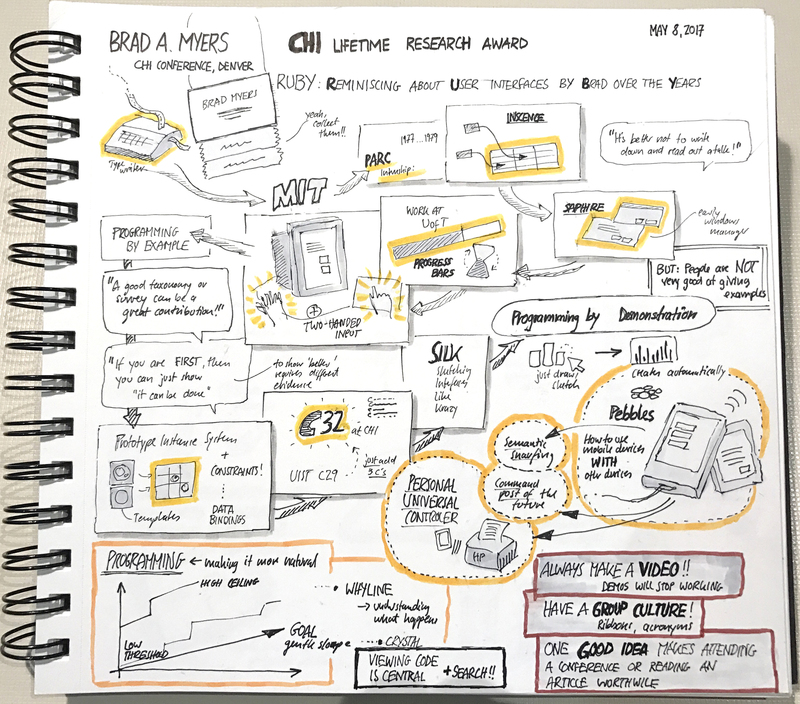 My Lifetime Research award talk at CHI'2017: video (1:18:12), slides, advisee tree, abstract, SIGCHI’s citation, Steven Feiner's introduction, and Nicolai Marquardt's "Sketchnote". "Human-Centered Methods for Improving API Usability." Stanford University Human-Computer Interaction Seminar on People, Computers, and Design, 27 October, 2017, Palo Alto, CA. YouTube video of talk. Keynote address at WAPI: 1st International Workshop on API Usage and Evolution (https://w-api.github.io/), May, 2017. "Human-Centered Methods for Improving API Usability". local pdf and slides. Co-Chair for the HCII 20th Anniversary Celebration! November 14–16, 2014. Try Unakite, our plugin for Chrome to help programmers organize information: https://unakite.info/. Pebbles Hand-Held Computer Project including the EdgeWrite text entry method (patented: U.S. Pat. No. 7,729,542 [Patent]). Quality of Life Technology (QoLT) Engineering Research Center. (See also my complete resume and publication list). Brad A. Myers is a Professor in the Human-Computer Interaction Institute in the School of Computer Science at Carnegie Mellon University. 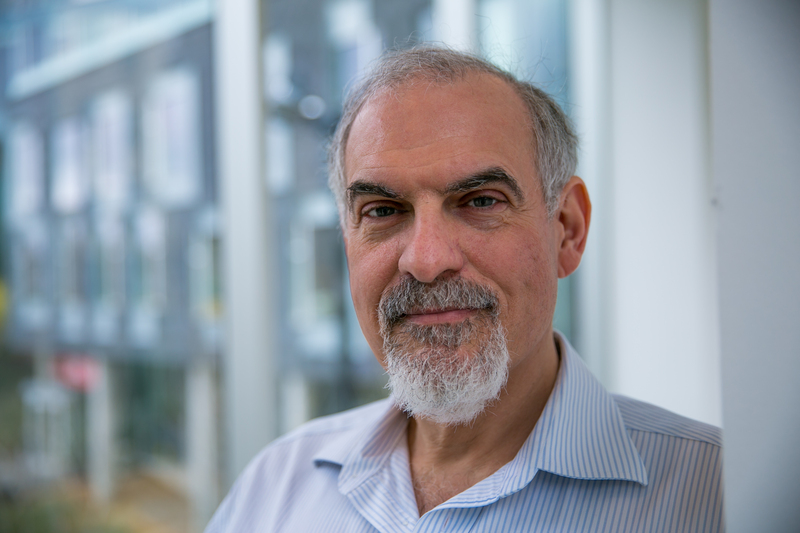 He was chosen to receive the ACM SIGCHI Lifetime Achievement Award in Research in 2017, for outstanding fundamental and influential research contributions to the study of human-computer interaction. He is an IEEE Fellow, ACM Fellow, member of the CHI Academy, and winner of 14 Best Paper type awards and 5 Most Influential Paper Awards. He is the author or editor of over 500 publications, including the books "Creating User Interfaces by Demonstration" and "Languages for Developing User Interfaces," and he has been on the editorial board of six journals. He has been a consultant on user interface design and implementation to over 85 companies, and regularly teaches courses on user interface design and software. Myers received a PhD in computer science at the University of Toronto where he developed the Peridot user interface tool. He received the MS and BSc degrees from the Massachusetts Institute of Technology during which time he was a research intern at Xerox PARC. From 1980 until 1983, he worked at PERQ Systems Corporation. His research interests include user interfaces, programming environments, programming language design, end-user software engineering (EUSE), API usability, developer experience (DevX or DX), interaction techniques, programming by example, handheld computers, and visual programming. He belongs to ACM, SIGCHI, IEEE, and the IEEE Computer Society. Kerry Shih-Ping Chang, PhD, HCII, May, 2016. A Spreadsheet Model for Using Web Services and Creating Data-Driven Applications. CMU-HCII-16-100. pdf. Currently at IBM. YoungSeok Yoon, PhD, ISR, May, 2015. Backtracking Support in Code Editing. pdf. CMU-ISR-15-103. Currently at Google. Stephen Oney, PhD, HCII May, 2015, Expressing Interactivity with States and Constraints. pdf. CMU-HCII-150-100. Currently, Assistant Professor at the University of Michigan School of Information. Thomas LaToza, PhD ISR, May, 2012, Answering Reachability Questions. CMU-ISR-12-104. pdf. Currently, Assistant Professor at Department of Computer Science, George Mason University. Jeff Stylos, PhD CSD, May, 2009, Making APIs More Usable with Improved API Designs, Documentation and Tools, CMU-CS-09-130. pdf. Currently, Software Engineer at IBM. Christopher Scaffidi, PhD ISR, May, 2009, Topes: Enabling End-User Programmers to Validate and Reformat Data, CMU-ISR-09-105. pdf. Currently, Assistant Professor at Oregon State University. Andrew Ko, PhD, May, 2008, Asking and Answering Questions about the Causes of Software Behavior. CMU-HCII-08-106 and CMU-CS-08-122. pdf. Currently, Associate Professor at University of Washington. Jeff Nichols, PhD, December, 2006, Automatically Generating High-Quality User Interfaces for Appliances. pdf. CMU-HCII-06-109. Currently, Research Scientist at Google. Jake Wobbrock. PhD, August, 2006, EdgeWrite: A Versatile Design for Text Entry and Control. Abstract and pdf. Currently, Associate Professor in the Information School and, by courtesy, in Computer Science & Engineering at the University of Washington. Michael Coblenz, MS CSD, 2006. JASPER: Facilitating Software Maintenance Activities With Explicit Task Representations. Currently, PhD student at CMU. Iván Eduardo González, BS CSD, 2006. Thumb Based Interaction Techniques for Input on a Steering Wheel. Currently, at Microsoft. Rajesh Seenichamy, MS, Information Networking Institute, August, 2003, Communicating With X-10 And Vehicle Functions To Enable Two-Way Remote Control. Rob Miller, PhD, May, 2002, Lightweight Structure in Text. Currently, Professor of Computer Science at MIT. Sailesh Panchang, MS, August, 2002, from the Dept. of Rehabilitation Science and Technology, University of Pittsburgh. Assessing Web Page Usability For Users Of Text To Speech Assistive Technology. Juan Casares, MS HCI, 2001. Currently, at Datrium. Rich McDaniel, PhD, May, 1999, Creating Whole Applications Using Only Programming-by-Demonstration. Currently at Siemens Corporate Research. James Landay, PhD, Dec. 1996, Interactive Sketching for the Early Stages of User Interface Design. Currently, Professor, Stanford University. Francesmary Modugno, PhD, 1995. (old CMU web page) Extending End-User Programming in a Visual Shell With Programming by Demonstration and Graphical Language Techniques. Currently, Associate Professor, Department of Obstetrics, Gynecology and Reproductive Sciences, University of Pittsburgh. 05-773A4: Computer Science Perspectives in HCI, (CS Mini), Spring, 2019, Mini 4. 05-440/05-640. Interaction Techniques, Spring, 2019. 05-863/45-888: Introduction to Human Computer Interaction for Technology Executives, Fall, 2018, Mini-2. 72 students. 95-763 Z5: Introduction to Human Computer Interaction for Technology Executives, Summer, Mini-5, 2018. (For the Heinz Executive Ed program). 9 students. 05-863/45-888: Introduction to Human Computer Interaction for Technology Executives, Fall, 2017, Mini-2. 75 students. 08-702, 08-703: Contextual Design, User Interface Design and Testing. For MSIT eBusiness program, Fall, 2017. 74 students. 95-763 Z5: Introduction to Human Computer Interaction for Technology Executives, Summer, Mini-5, 2017. (For the Heinz Executive Ed program). 12 students. 05-773A3: Computer Science Perspectives in HCI, (CS Mini), Spring, 2017, Mini 3. 31 students. 05-830: Advanced User Interface Software. Spring, 2017. 7 students. 05-863/08-763/45-888: Introduction to Human Computer Interaction for Technology Executives, Fall, 2016, Mini-2. 73 students. 08-702, 08-703: Contextual Design, User Interface Design and Testing. For MSIT eBusiness program, Fall, 2016. 56 students. 95-763 Z5: Introduction to Human Computer Interaction for Technology Executives, Summer, Mini-5, 2016. (For the Heinz Executive Ed program). 12 students. 05-440/05-640 Interaction Techniques, Spring, 2016. 30 students. 05-863/08-763/45-888: Introduction to Human Computer Interaction for Technology Executives, Fall, 2015, Mini-2. 70 students. 08-702, 08-703: Contextual Design, User Interface Design and Testing. For MSIT eBusiness program, Fall, 2015. 76 students. 05-773A3: Computer Science Perspectives in HCI, (CS Mini), Spring, 2015, Mini 3. 12 students. 08-702, 08-703: Contextual Design, User Interface Design and Testing. For MSIT eBusiness program, Fall, 2014. 78 students. 95-763 Z5: Introduction to Human Computer Interaction for Technology Executives, Summer, Mini-5, 2014. (For the Heinz Executive Ed program). 17 students. 08-702, 08-703: Contextual Design, User Interface Design and Testing. For MSIT eBusiness program, Fall, 2013. 65 students. 95-763 Z5: Introduction to Human Computer Interaction for Technology Executives, Summer, Mini-5, 2013. (For the Heinz Executive Ed program). 14 students. 05-773A4: Computer Science Perspectives in HCI, Spring, 2013, Mini 4. 14 students. 05-830: Advanced User Interface Software. Spring, 2013. 15 students. 05-863/08-763/46-863: Introduction to Human Computer Interaction for Technology Executives, Fall, 2012, Mini-2. 60 students. 08-702, 08-703: Contextual Design, User Interface Design and Testing. For MSIT eBusiness program, Fall, 2012. 47 students. 05-899D: Human Aspects of Software Development (HASD), Spring, 2011. 7 students for credit, plus 5 audit. 05-863/08-763/46-863: Introduction to Human Computer Interaction for Technology Executives. Fall, 2010, Mini-2. 65 students. 08-702, 08-703: Contextual Design, User Interface Design and Testing. For MSIT eBusiness program, Fall, 2010. 47 students. 05-671/672: Masters HCI Project. Spring/Summer, 2010. 12/48 units. 50 students. 05-863/08-763/46-863: Introduction to Human Computer Interaction for Technology Executives. Fall, 2009, Mini-2. 32 students. 08-702, 08-703: Contextual Design, User Interface Design and Testing. For MSIT eBusiness program, Fall, 2009. 24 students. 05-830: Advanced User Interface Software. Spring, 2009. 6 students. 08-702, 08-703: Contextual Design, User Interface Design and Testing. For MSIT eBusiness program, Fall, 2008. 38 students. 05-863 / 08-763 / 46-863: Introduction to Human Computer Interaction for Technology Executives. Fall, Mini 2, 2008. 05-863 / 08-763 / 46-863: Introduction to Human Computer Interaction for Technology Executives. Fall, Mini 2, 2007. 39 students. 05-671/672: Masters HCI Project. Spring/Summer, 2007. 12/48 units. 29/28 students. 17-770: Human Computer Interaction for Technology Executives. (For the Tepper School of Business, Technology Leadership Track). Fall, 2006. 12 students. 05-671/672: Masters HCI Project. Spring/Summer, 2006. 12/48 units. 29/28 students. 05-830: Advanced User Interface Software. Fall, 2004. 20-790: Human-Computer Interaction for eCommerce. 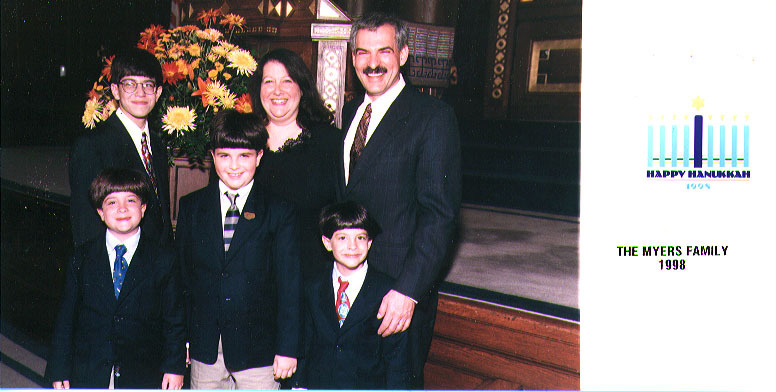 Mini-6, Summer Session Two, 2004. 05-630 / 05-430, Programming Usable Interfaces. Spring, 2004. 05-830, Advanced User Interface Software. Spring, 2003. 96-766, 96-768, 96-771: CMU West Campus - Information Technology Masters of eBusiness Technology, Contextual Design, Fall, 2002 and Spring 2003. 20-790: Human-Computer Interaction for eCommerce. Fall, second mini, 2002. Human-Computer Interaction in eCommerce. June 26 - August 9, 2002. 05-631 Software Architecture for User Interfaces, Fall, 2001. 20-790: Human-Computer Interaction for eCommerce. Fall, second mini, 2001. Human-Computer Interaction in eCommerce. Summer, 2001. 45 students. One Week Short Course: "User Interface Design and Implementation". Taught with Bonnie John, Randy Pausch, Ken Koedinger, Jodi Forlizzi and Len Bass. July 17-21, 2000. 05-830, User Interface Software, Spring, 2001. 05-830, User Interface Software, Spring, 2000. 05-830, User Interface Software, Spring, 1999. 05-830, User Interface Software, Spring, 1998. 05-830, User Interface Software, Spring, 1997. 15-621 and 15-499(A), Intro to User Interface Programming, taught with Dan Olsen, Fall, 1996. 15-820 (B) Advanced Topics in HCI: User Interface Software, Spring, 1996. 17-698B or 15-499A Introduction to User Interface Programming, taught with Jim Morris, Fall, 1995. 15-820(C) or 15-499(B), Advanced Topics in HCI: User Interface Software, Spring, 1994. Journal of Visual Languages and Sentient Systems. Here is my Father's page: Bert Myers. One of my sons, Ryan Myers, works for Industry Weapon in Pittsburgh. My parent's collection of historical papers: Grossman and Myers families papers, Manuscripts Collection 909, Louisiana Research Collection, Howard-Tilton Memorial Library, Tulane University, New Orleans, LA 70118. My sister, Melanie Bronfin, is the Executive Director, Louisiana Policy Institute for Children. My brother-in-law Jonathan Herman, has his own boutique law firm: Herman Law Firm and writes a newsletter. My YouTube channel and the playlist of my group's videos. SIGCHI Lifetime Achievement Award in Research, 2017. Citation, video (1:18:12), slides, advisee tree, abstract, Steven Feiner's introduction, and Nicolai Marquardt's "Sketchnote". 11th by h-index and 6th by i10-index in HCI by scholar-scraper. IEEE Symposium on Visual Languages, VL'2000, Seattle, Washington, where I gave the opening keynote. The Human Computer Interaction Working Group of the ACM Workshop on Strategic Directions in Computing Research, Cambridge, Massachusetts, June 14-15, 1996, of which I was co-chair. UIST'95 that I was the chair for.